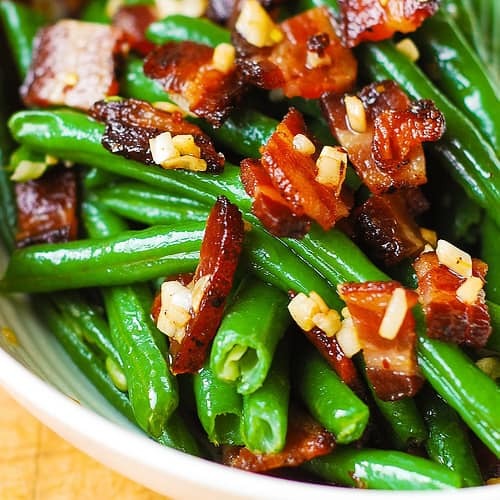 Garlic and Bacon Green Beans sautéed in olive oil and butter in a large skillet on stove top – an easy and delicious way to prepare the green beans for the holiday menu. The beans are crispy and crunchy. Perfect recipe for the Fall and the Winter. I love garlic with just about anything, and the green beans are no exception! 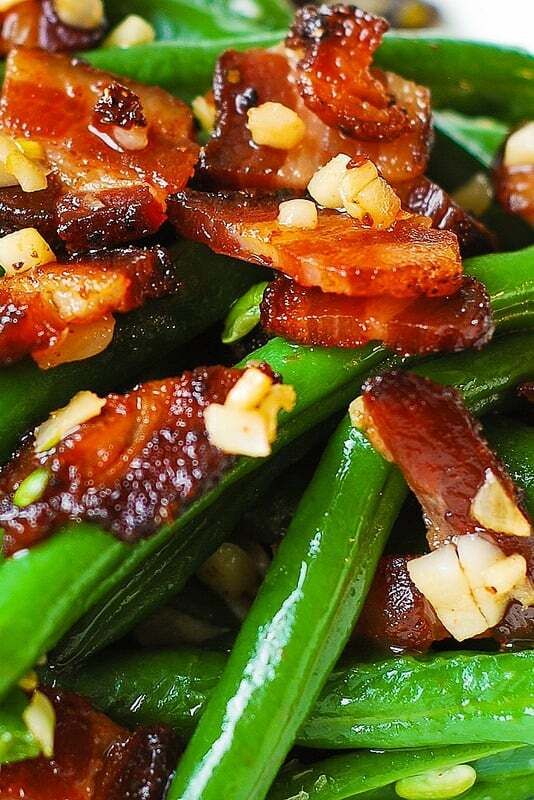 Sauteed garlic tastes GREAT with green beans and bacon! This is a great side dish for many grilled meats, and it’s especially good for holiday menu on Thanksgiving, Christmas, or New Year’s Eve. Roast Duck – an ultimate Thanksgiving main course! This Roast Whole Duck has tender and juicy meat, crispy skin, and it’s glazed with the honey-balsamic glaze to give the duck a beautiful roasted look. Roasted Cornish Hen – roasted paprika Cornish hen with root vegetables (carrots, sweet potatoes) and onions. Roasted Turkey Breast (Boneless) with Garlic Herb Butter – this is a rolled turkey breast recipe and is a great alternative when you don’t feel like cooking the entire turkey. Roasted Butternut Squash Salad with Brussels Sprouts, Pecans, and Cranberries – colorful Thanksgiving salad with lots of veggies and nuts! Creamy and Crunchy Salad with Peas, Bacon, and Pecans – easy and beautiful side dish for Thanksgiving! Dijon Mustard Brussels Sprouts with Bacon, Apples, and Gorgonzola cheese – Brussels sprouts smothered in heavy cream and mustard with bacon, apples, Gorgonzola cheese and nutmeg. Cooked on stove top. Bring a large pot of water to boil, add 1 pound of fresh green beans and 1/2 teaspoon of salt. The water should be just above the beans. Boil on medium heat for 5 minutes. Drain the beans. Heat 1 tablespoon of olive oil and 1 tablespoon of butter in a large skillet on medium heat. Add 6 cloves of minced garlic and saute, constantly stirring, for about 30 seconds. Add chopped cooked bacon (drained of fat) and green beans (cooked and drained). Saute on medium heat for about 1 minute to combine all ingredients. Remove from heat. Season with more salt, if needed. Winter Fruit Salad with Maple Lime Dressing – the ingredient list includes red apples, pears, clementine oranges (or mandarin oranges), kiwi fruit, dried cranberries, and pomegranate seeds. Butternut Squash and Spinach Salad with Pecans, Cranberries, Pomegranate – perfect healthy Thanksgiving salad with Poppy Seed Honey-Lime Dressing. Honey Mustard Brussels Sprouts Salad with Cranberries and Pecans – this holiday salad is all about crisp, shredded Brussels sprouts tossed with slightly sweet honey mustard vinaigrette, dried cranberries and chopped pecans. Warm Quinoa and Brussels Sprout Salad in Honey Mustard Vinaigrette – this salad is loaded with pecans and cranberries. It is a nutrient-packed salad that is high in fiber and antioxidant properties. A perfect addition to a healthy menu! 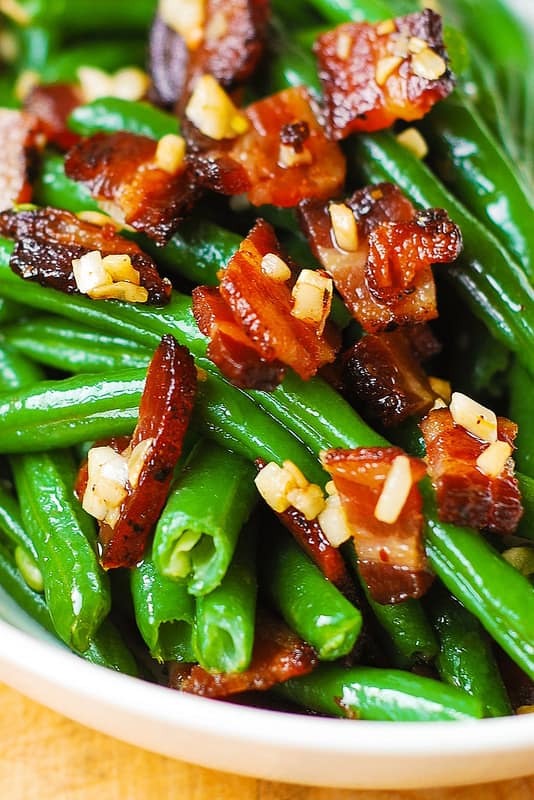 Garlic and Bacon Green Beans sauteed in olive oil and butter - an easy and delicious way to prepare the green beans for the holiday table! Bring a large pot of water to boil, add green beans (water should be just above the beans), and 1/2 teaspoon salt. Cook on medium-low heat for 5 minutes, drain the beans. Heat olive oil and butter in a large skillet on medium heat. Add minced garlic and cook it, constantly stirring, for about 30 seconds. Add chopped cooked bacon (drained of fat) and green beans. Saute on medium heat for about 1 minute to combine all ingredients. Remove from heat. Taste and add more salt, if needed. Supposed to bring green beans to family Christmas dinner. This looks great, but now I find the main dish will be HoneyBake Ham. Maybe too much bacon all at once? Think maybe green beans with slivered almonds would be a better match? 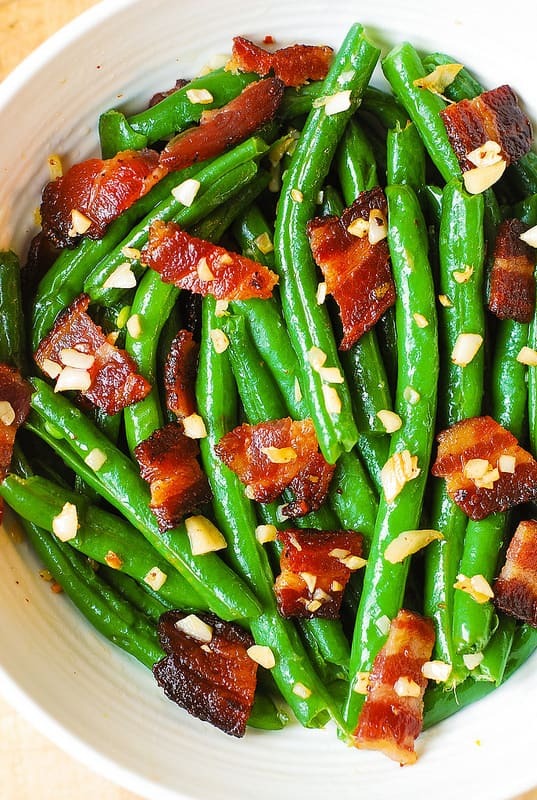 I don’t think it’s too much bacon, but green beans with almonds sound delicious, too!